In the 1920s, shortly after his rise to power in Italy, Benito Mussolini declared war on the Sicilian Mafia, ordering his number one enforcer, Cesare Mori, prefect of Palermo, to wipe out the criminal gangs. Mori conducted a brutal campaign of terror and torture and forced many mafiosi to flee. Many of these headed for the United States in what came to be known as the "Mussolini Shuttle." The mafiosi so forced to come to America became powers in the underworld and did much to mold the forces of organized crime. Known as the "Twenties Group," they included Carlo Gambino, who passed through customs on December 23, 1921, a pre-Mussolini refugee but one already feeling official heat in Sicily. Within the next several years, Gambino was followed by Joe Bonanno, Antonio Magaddino and Stefano Magaddino in 1924; Joe Profaci, Mike Coppola and Joe Magliocco in 1926; and Salvatore Maranzano in 1927. All these men would rise to be the bosses or underbosses in various crime families. All came more or less as representatives of Don Vito Cascio Ferro—if not the so-called boss of bosses of the Mafia in Sicily, then certainly the most powerful and colorful chieftain. Ferro clearly had designs on expanding his influence in America, and so great was his power and influence that all his protégés moved into positions of power in America with startling speed. The Twenties Group found a great many allies already in the United States, mafiosi like Joe Aiello, the leading Mafia leader in Chicago who would eventually fall under the guns of non-mafioso Al Capone; Joe Zerilli, a power in the Detroit family; and Gaetano Reina, Tommy Lucchese and Tom Gagliano in Brooklyn. With the imprisonment of Don Vito Cascio Ferro in 1929, the Twenties Group splintered, although for a time Don Vito's top representative in the United States, Maranzano, tried to establish himself as the boss of bosses. 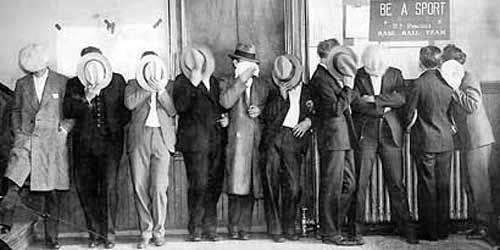 The Twenties Group proved to have no more lasting allegiance to the Sicilian traditions than other opportunistic gangsters had had, and soon the Twenties members formed alliances with other non-Mafia gangs in the quest for a more tangible tradition—the American dollar.